As innovation goes beyond Research and Development, the Chief Innovation Officer is the main person responsible for guiding technology innovation within organisations, say 35% of the executives surveyed by KPMG’s Global Technology Innovation report. The report also shows that a growing number of organisations are nurturing innovation at the strategic planning level. The number of patents, revenue growth, brand/reputation barometer, market share, market value, and ROI are favoured metrics for quantifying the value of innovation, whereas the availability of talent is seen as the strongest enabler for technology innovation. Overall, respondents believe incentives are the most effective approach for motivating employees to innovate. With growing ecosystems spreading across all industries, the US (26%) and China (25%) continue to be the most promising markets for technology breakthroughs that have global impact. India comes third. 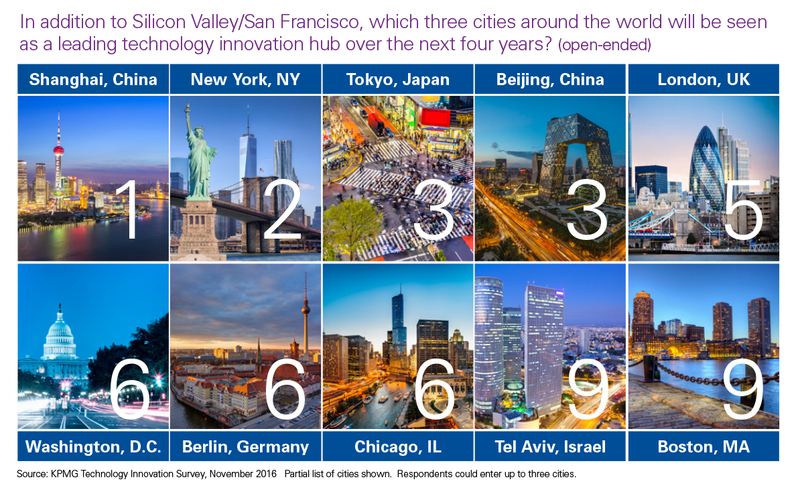 In terms of which cities are involved, Shanghai is the fittest candidate to rival Silicon Valley/San Francisco in technology innovation over the next four years, followed by New York, Tokyo, and Beijing. According to the executives surveyed, Singapore is also fast emerging as a financial technology innovation hub. Elon Musk, the Tesla and SpaceX CEO, tops the list of the global technology innovation visionaries. In second comes Tim Cook, CEO of Apple, while Alibaba’s Chairman, Jack Ma, Larry Page, Alphabet CEO, and the CEO of Google, Sundar Pichai, are tied in third. Google is seen as the top innovative company, followed closely by Apple, Microsoft, IBM, and then another tie between Amazon and Tesla. The report dedicated to global technology innovation hubs is the first part of KPMG’s “The Changing Landscape of Disruptive Technologies 2017” publication series. KPMG surveyed 841 technology industry business leaders, analysing leadership, market trends and progress in technology innovation in 15 key countries around the world.